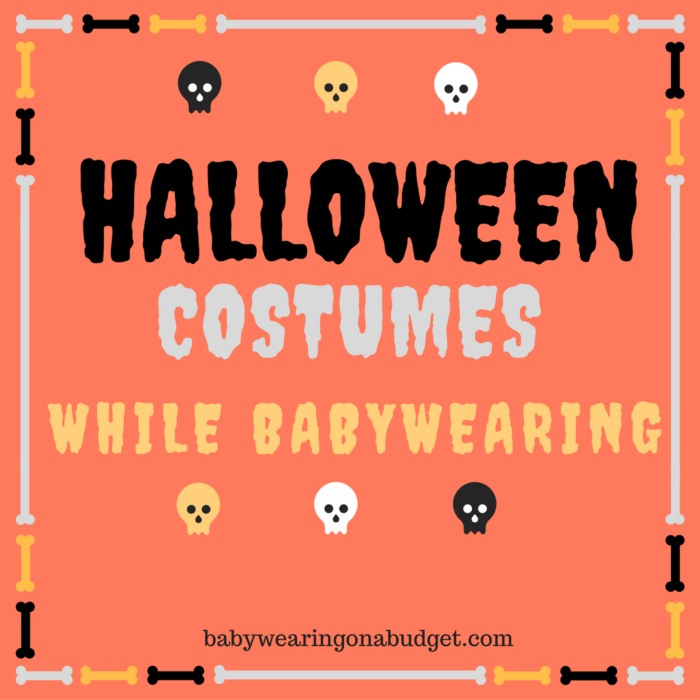 Let’s check out some costumes that may work for your baby/toddler and the carrier you’ll bring with you on Halloween! Elf! 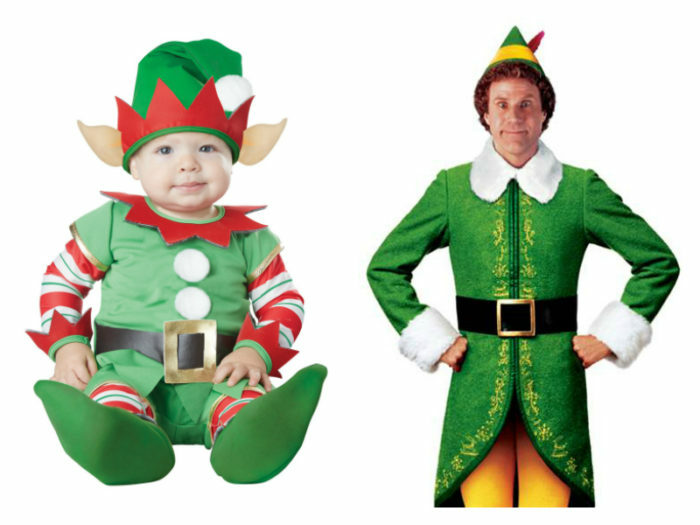 Baby and Dad can dress up as Buddy the Elf! Isn’t smiling everyone’s favorite? Also, the shoes can be taken on and off. Just be sure to pull enough of slack for baby’s feet in the tights. You don’t want his toes jammed because the tights were short when you put him in a carrier. Reindeer and Santa! 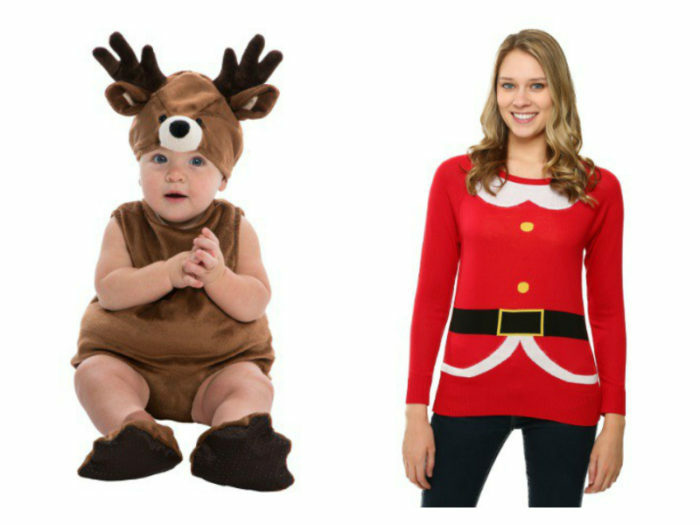 I love this baby Reindeer costume because you can add a long sleeve onesie if it is cold. If you’re in So Cal like me, it’ll probably be hot on Halloween. The little reindeer feet are removable and you can add leggings to keep baby warm. As for mama, if you’re not into costumes, this Santa sweater will be perfect. It’s lightweight and won’t get in the way of straps or buckles on your SSC or ring sling. Add black leggings and you are all set! Batman vs Superman! This is so much better than the movie – I guarantee it! Haha! If you’ve got twins or multiples, this would be so cute! Batman is a onesie where the feet are open so you can add your own shoes or black socks to keep baby warm. The cape and head piece are also removable which is good if you’re wearing baby. You can re-attach once baby is secure in your carrier or wrap! 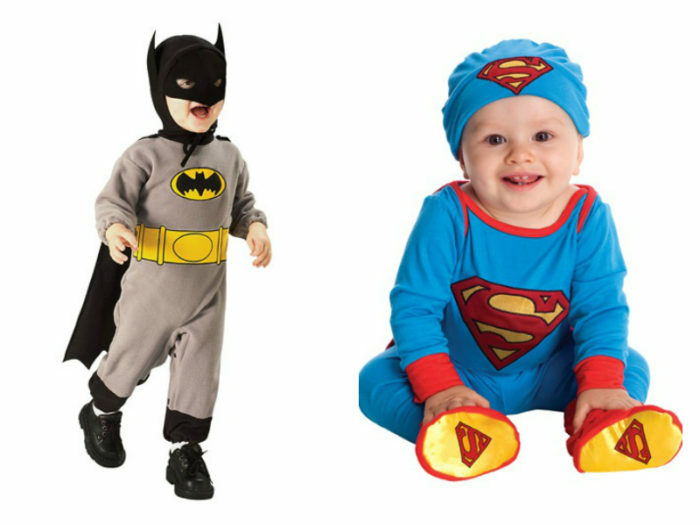 Superman is a onesie – so again, when you wear baby, pull down the leg/foot area so baby has some slack for his feet. There is also a Superman costume that is a romper, similar to the Batman costume. It also has a removable cape. Vader and Leia – This is totally old school but you’d be ready for both Halloween and the premiere of Rogue One in December! 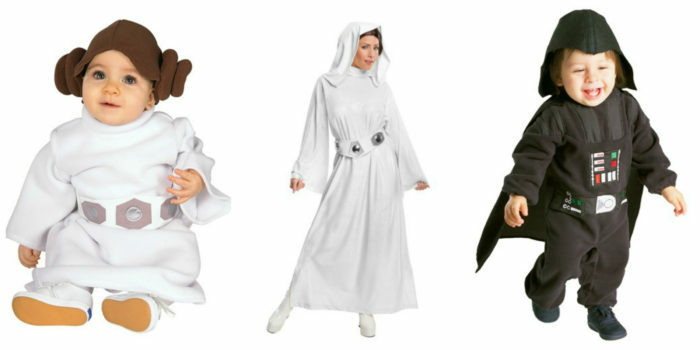 Even thought the adult Leia costume is a dress, it would be easy to throw some leggings under and keep warm. Ghostbusters! Who you gonna call? Don’t mind the creepy male model. 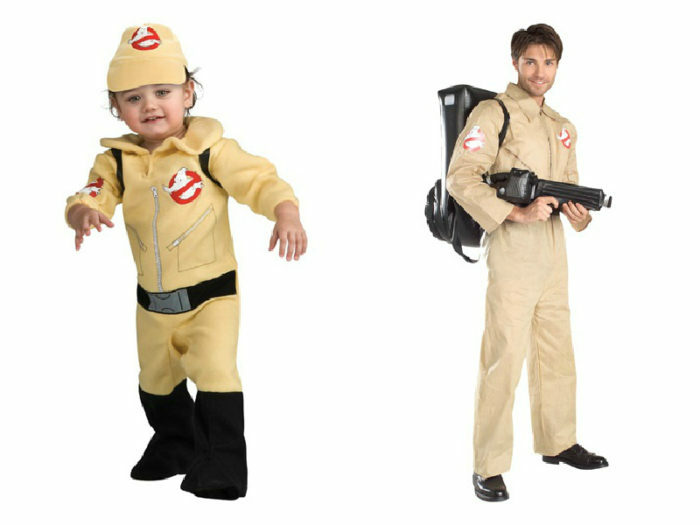 The adult costume can be for a mom or dad. I’d look a hip pack or sling because this costume doesn’t have pockets. Better still you might try DIY-ing a Dickies coverall instead. There are lots of other pairings for you and baby! What are you thinking of dressing up as for Halloween?